Location: Morne Daniel, quiet hillside suburb above Canefield, south west coast of Dominica. Description: A luxury villa with swimming pool at an elevated location, enjoying excellent views of the Caribbean Sea. Half acre landscaped garden has lawns and fruit trees. Car Port. 4 bedrooms, 3 bathrooms. At first floor level is a generous living area with lounge and separate dining, with bedroom wing at split level (up a short flight of stairs). Fully equipped kitchen with washer, dryer, dishwasher, cooker, microwave oven and large fridge. Opens onto a sea facing balcony and the swimming pool deck. The ground floor is a self contained flat with lounge and one bedroom, equipped with a home entertainment centre. All bedrooms are equipped with air conditioning, fans and TV. Maid service provided twice weekly. The telephone will accept all calls but only local outgoing calls may be made. ADSL internet available for laptop pc's. Comments: Built to a high standard in one of the most desirable suburbs of Dominica's capital, Roseau. 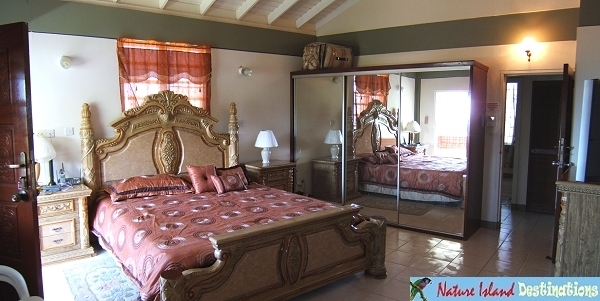 A tranquil setting enjoying excellent views both up and down the coast and beautiful sunsets over the Caribbean Sea. A convenient location for the banks, shops and restaurants of Roseau, which may be reached in less than 10 minutes by car, and for the natural attractions of our World Heritage Site - the Morne Trois Pitons National Park, accessed via the Roseau Valley or the nearby village of Cochrane. Samaan Gardens restaurant, a bank, supermarket, filling station and Donkey Beach at Canefield are just a 5 minutes drive away. Vehicle hire is recommended. There is no restriction on accepting children, though the owners and management take no responsibility for swimming pool related accidents or death resulting from lack of supervision. The extra person rate applies to both adults and children. Please note that in September 2017 Dominica was hit by category 5+ hurricane Maria which caused extensive damage to properties, roads and our utilities infrastructure. Restoring power and water has taken many months and some areas are still without land line telephone . 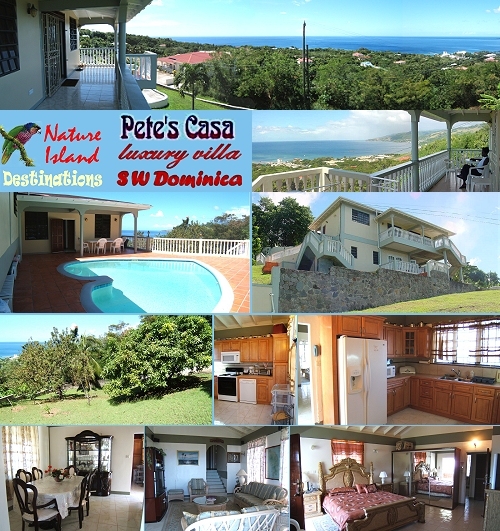 addressed to Nature Island Destinations Ltd. on which to request your holiday accommodation in Dominica.